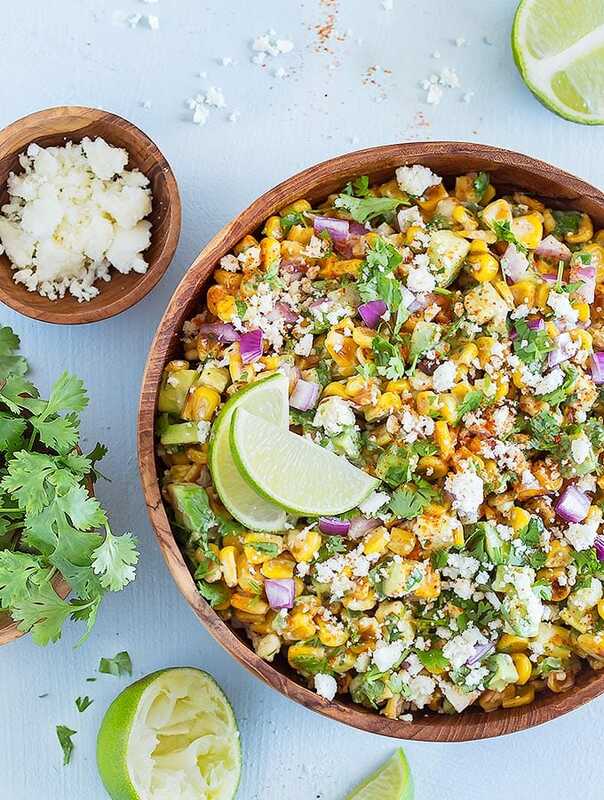 Mexican Street Corn Salad with Avocado is always a crowd-pleaser! It’s fast and easy to prepare, and has a tasty balance of fresh flavors and textures! As the weather heats up, we want to spend time outdoors – and that includes dinner time! 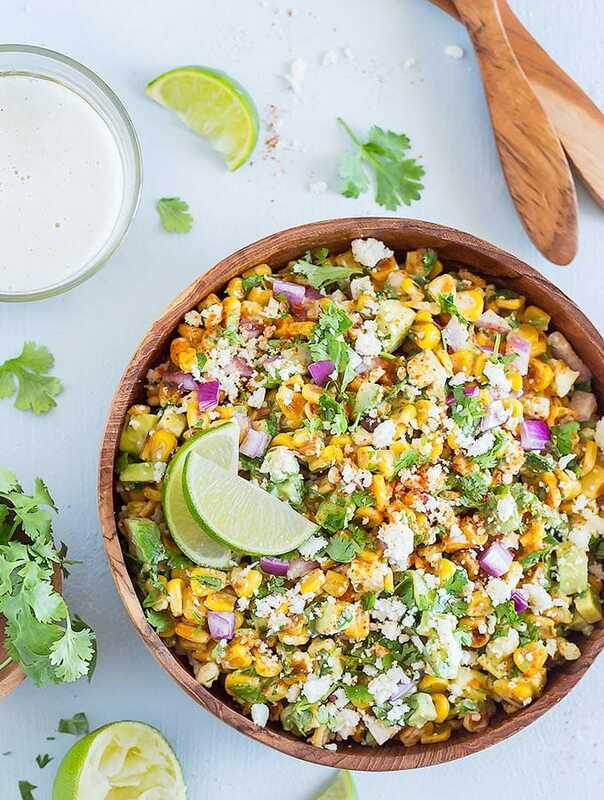 If you’ve been thinking about leaving your stove off in favor of firing up the grill, you’ll enjoy making Mexican Street Corn Salad all summer long. As a side or a light meal, this salad features fresh vegetables with a squeeze of citrus and kick of spice. It blends the flavors of smoky roasted corn, creamy avocado, fresh cilantro, zesty red onion, crumbly Cotija cheese, and jalapeño for a fiery kick. The veggies are dressed with a simple combination of cayenne pepper, mayonnaise, and lime juice, bringing out the boldness of the dish. Mexican Street Corn Salad has a little bit of everything: it’s sweet, savory, and tangy with a bit of spice. Aside from highlighting some of the season’s freshest flavors, this recipe has so many great textures, from creamy to crisp, that it’ll add interest to any meal – especially if you’re eating outdoors! 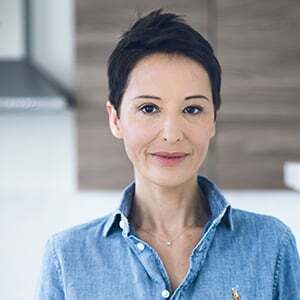 I love serving it as a side at barbecues, or I’ll even eat it as a cool, light dinner when the weather really heats up. In addition to being delicious, this salad is super easy to prepare, taking about 20 minutes total. The most time-consuming part is roasting the corn, which can be done on a grill or in a cast iron pan (I usually dice the rest of my vegetables and whisk the dressing while it’s cooking). Then you simply add the roasted corn to a bowl along with the remaining ingredients, pour the dressing, and toss everything up! Top it off with extra cheese and a squeeze of lime juice and you have a mouthwatering, colorful dish that’s ready to serve. 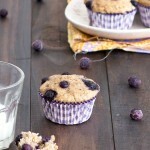 The recipe can be altered to fit the preferences of you and your guests. For instance, if you can’t find Cotija, then feta, queso fresco, or parmesan are all suitable alternatives. (Cotija has a crumbly texture and a salty taste.) Also, you can adjust the level of spice to your liking – I like a moderate amount, so I used one jalapeño. You can add more or omit the pepper altogether. And for the mayonnaise in the dressing, you can use a light version, or opt for plain Greek yogurt. Another tip is to toss in the avocado right before serving so it doesn’t turn brown. This was an ingredient that I chose to add (I mean, who doesn’t love avocado? ), and it always looks and tastes best when it’s fresh! I also add the cheese last minute so that it doesn’t get soggy. 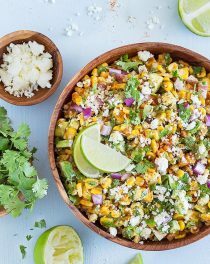 I love bringing Mexican street corn salad with avocado to outdoor get-togethers, and it’s always a crowd favorite. It goes with just about any type of protein, especially if it’s grilled. Serve it with chicken, steak, salmon, or everyone’s favorite: hamburgers and hot dogs! And did I mention how delicious it tastes when paired with an ice cold Mexican beer? This dish saves well for two to three days in the refrigerator (again, as long as the avocado is left out and added separately). Sometimes I’ll make a big batch to eat with dinner, then have it for lunch the next day. I like scooping it up with tortilla chips and topping it with shreds of cheese for a tasty, hearty meal. You can also put a scoop of the salad on top of rice and finish it with cheddar and a dollop of sour cream for an easy-to-make Mexican bowl. 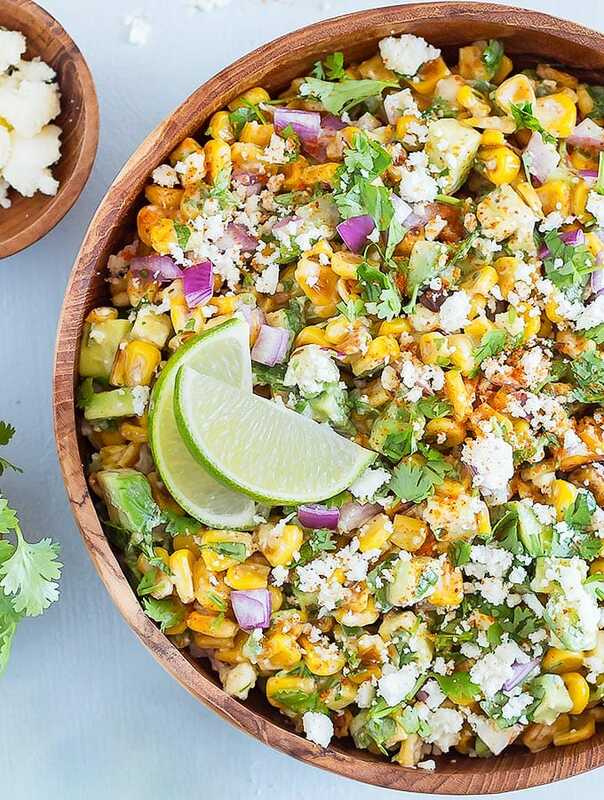 Inspired by traditional street food, Mexican Street Corn Salad will be a hit at all your summer barbecues and get-togethers, whether you’re cooking for a crowd or just for yourself! If you try this Mexican street corn salad with avocado, let me know what you think! Leave a comment, rate it, and don’t forget to tag a photo #aseasyasapplepie on Instagram. 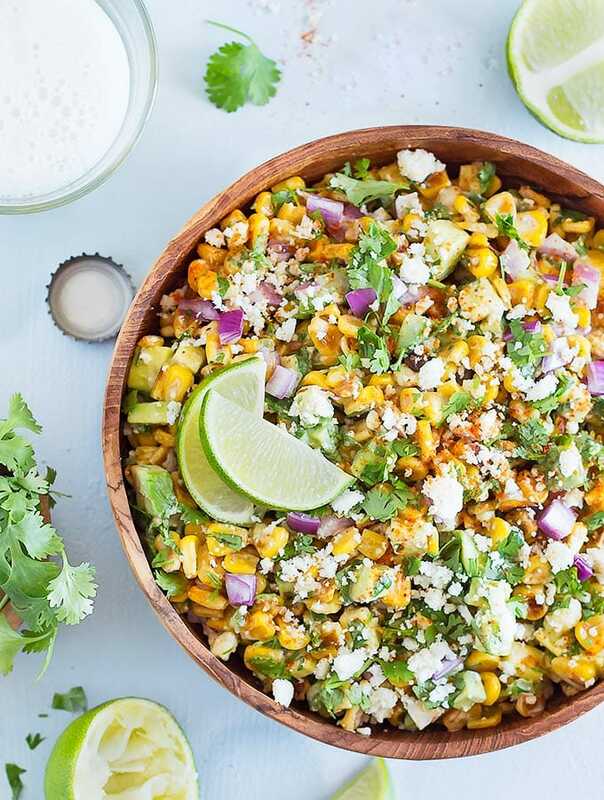 This Mexican Street Corn Salad with Avocado is ideal for casual entertaining and outdoor get-togethers. 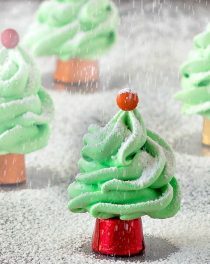 Serve it cold, warm, or at room temperature. If you can’t find Cotija, feta would be a great alternative. I made it with avocado and it was delicious. I put the avocado in the bowl first and poured the lime juice over it to prevent browning and it was just fine. It didn’t get mushy. Some of it was soft but it just added to the creaminess which I loved. It was better the second day and I added a can of black beans to it to extend it. Will definitely make this again. I will probably use Greek yogurt next time for a more tangy flavor but overall amazing! AMAZING. I made this and everyone was asking for the recipe. We ate it as a dip/pico de gallo type thing with chips as a side to enchiladas, beans and rice. The only thing I changed was I used one can of black beans with 2 cans of corn, instead of all three of corn. I have also doubled the recipe using three cans black beans, three cans corn. I will be making this a lot more! I am so glad you liked this recipe, Jessica! I made this tonight for a barbecue and everybody LOVED it. I made the dressing separately and we also used it for burger dressing. My changes: changed the mayo to a mix of mayo and crema mexicana (sour cream), and added some chili powder. I made this today and added two pinches of cumin to the dressing mix and sprinkled paprika on top of the assembled salad for some added color. Then I tasted it and promptly added it to my go to recipes folder, soooooo good. It was going to be a side salad, but I just ended up having the whole thing for dinner. Thank you so much for sharing! I made this (with the avocado) for my husband to take to a work party. I substituted sour cream for half of the mayo and put the cilantro on the side (never has there been such a polarizing herb! )-it was a huge hit. 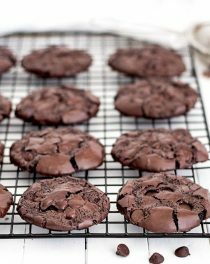 Thank you for the great and easy to follow recipe. This was delicious! I added grape tomatoes cut in half, and forgot the feta!! I also omitted the cayenne, as my kids don’t like too much heat. This was a huge hit, and will definitely be making again and again. I am so glad to hear that, Kristin! 🙂 Thank you for the feedback!